By Jennifer Burcke on October 15, 2012 Visit Jennifer's Website. by Jennifer BurckeI chose to become a chicken keeper for a host of reasons, but the same two are always at the top of my list. First, I wanted to connect to the generations of my family that had come before me. They were farmers and I wanted to continue the family tradition of raising my own food and tending to our own flock. Secondly, I wanted to share this experience with the current generations of my family. By adding a flock of chickens to our home at 1840 Farm, I was able to do just that. Every day, I find myself sharing the chicken keeping experience with my parents, husband, and two children. Two years ago, we were just beginning our lives as chicken keepers. Now it is nearly impossible to imagine our lives without the two coops of heritage breed hens that call 1840 Farm home. Tending the chickens and minding the coops is so ingrained in our daily lives that it has simply become second nature. Instead of feeling as though the act of chicken keeping is a chore, I see it as an adventure that we enjoy together. Watching my children interact with our flock and our other livestock inspires me every day to keep perfecting the craft of farming here on our family farm. 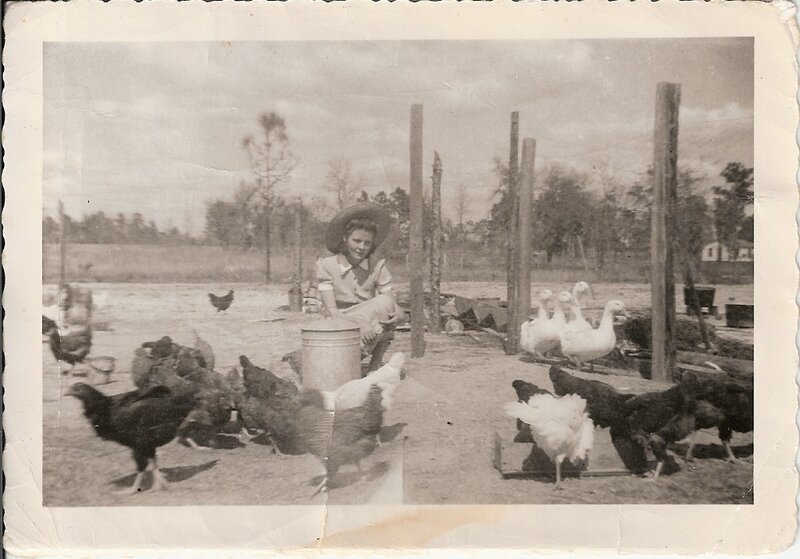 It’s no wonder that I am proud to call myself a fifth generation chicken keeper. I’m even prouder to be raising two sixth generation chicken keepers! Last week, reader Donna McGlasson shared her inspiration to be a chicken keeper with me. Her story is heartwarming. The photo she provided is a priceless reminder of the universality of the chicken keeping experience. While we have never met, we have both chosen to nurture our chicken keeping heritage. Ironically, we have also both chosen to name hens after our Grandmothers. This week, I am proud to share her story with you in her own words. When I was a little girl, my Granny and my Pop lived next door from the time I was six years old on and we had always stayed with Granny during the day while Mom and Dad worked. Granny was an animal lover. She always had chickens, ducks, geese, dogs, cats, birds and at times, rabbits and one pet squirrel. My dad always had a cow or two and my brother and I had a Shetland pony for a while named Teddybear. He was no teddy bear! Anyway, we always had plenty of eggs to go around and Granny made the best pound cakes you ever tasted with all those fresh eggs. We never worried about salmonella or getting sick from eating cake batter with raw eggs. We licked the bowl; the beaters and sometimes she even save us a little bowl of batter. Those eggs were so yummy and when chicks or ducklings hatched we had babies to hold and play with. We learned early that animals were supposed to be treated kindly and depended on us for food and water. Here is my inspiration for wanting chickens. This is my Granny, Mildred Rebecca Shores Parrish; she was 24 here and pregnant with her fourth child, my Uncle Bob, my Mom, Becky, is the oldest of five children. I love this photo! Granny and my Pop had just moved from Havana, FL to Tampa, FL for a better life and bought this property. It is still in my family 70 years later, there are 6 acres between this property and my Mom’s. Mom and Dad later bought the property next to Granny’s a d Pop’s. Myself, my brother, Donnie, and my cousin, Penny, were lucky enough to have Granny as our “daycare” and grow up with all these animals. I lived next door for most of my growing up days. One of my hens (girls) is named Mildred for Granny. I know Granny’s smiling at that. Thank you Donna for sharing your wonderful story with us. Do you have a story to share about your chicken keeping experience? I would love to read all about it and share it with Community Chickens readers. Visit 1840 Farm to share your story. that’s an awesome and cute story! thx!